On 22 February 2019, the Crimean Bar Association decided to maintain the membership of the human rights lawyer Emil Kurbedinov, contrary to the request received from the Crimean Directorate of the Ministry of Justice of the Russian Federation. Emil Kurbedinov is an outspoken human rights lawyer in Crimea. Since the occupation of Crimea by the Russian Federation, he has been actively involved in defence of the Crimean Tatars, who have become one of the major targets for the authorities, as well as civil society activists and journalists. He has also drawn attention to human rights violations in Crimea using social media, international conferences and reporting before international human rights mechanisms. On 22 February 2019, the Crimean Bar Association considered the possibility to exclude Emil Kurbedinov from the list of its founders and members. The Association decided to maintain his membership after establishing a special commission for this purpose, in accordance with Russian law. On 10 January 2019, Emil Kurbedinov received a letter (dated 18 December 2018) from the Crimean Directorate of the Ministry of Justice of the Russian Federation notifying him that according to 1.2 (4) of Article 15 of the Federal Law “On non-commercial organisations”, a person that has been convicted of extremism cannot be a founder or a member of non-commercial organisation. Emil Kurbedinov is founder and member of Crimean Bar Association. The letter refers to two administrative convictions of Emil Kurbedinov for a post that he published on two of his social media accounts. 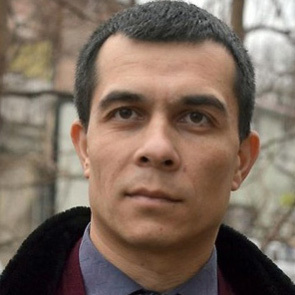 On 10 January 2019, Crimean human rights lawyer Emil Kurbedinov received a letter from the Crimean Directorate of the Ministry of Justice of the Russian Federation notifying him that he will be excluded from the Crimean Bar Association before 1 March 2019. Emil Kurbedinov is an outspoken human rights lawyer in Crimea. Since the occupation of Crimea by the Russian Federation, he has been actively involved in the defence of the rights of Crimean Tatars who became a targeted group, along with civil society activists and journalists. He provides people with legal aid, observes searches at activists’ homes and uses social media and international conferences to bring public attention to human rights violations in Crimea. Emil Kurbedinov is a recipient of the 2017 Front Line Defenders Award for Human Rights Defenders at Risk. Besides, Skrypnyk added, that according to her information, the Russians opened 44 criminal cases for political reasons in Crimea last year. The human rights activist reported that at least six people were arrested in Crimea in administrative cases. “The most well-known case out of them is the deprivation of liberty of lawyer of numerous political prisoners and Crimean Tatar advocate Emil Kurbedinov. It is an example that the pressure is still put on the lawyers in Crimea,” she said. Lawyers in Russia-occupied Crimea have been receiving threats since the detention of their colleague Emil Kurbedinov, the Verkhovna Rada’s Commissioner for Human Rights Liudmyla Denysova has said. At the same time, she voiced the belief that the fact that Kurbedinov has been arrested for five days has to do with his intentions to defend Bohdan Nebylytsia, one of the Ukrainian seamen taken prisoners of war by Russia, who happens to be the captain of the Nikopol warship that was seized by Russians on November 25. “Following the situation with Kurbedinov, lawyers in Crimea have been receiving threats from law-enforcement bodies of the occupation authorities of Crimea,” Denysova wrote on Facebook on December 10. As earlier reported, Russia-controlled Kyivsky district court in Simferopol (occupied Crimea) on December 7 arrested lawyer Emil Kurbedinov for a period of five days on suspicion of disseminating extremist information on the Internet. On December 6, the occupation authorities of the Russian Federation detained in Crimea lawyer Kurbedinov who has, in particular, defended the rights of the Ukrainian naval personnel taken prisoners of war by Russia on November 25. Russia-imposed authorities in Crimea have detained a prominent lawyer, Emil Kurbedinov, his colleagues say. “I call on the lawyers’ community, public organizations, and representatives of international organizations to immediately react to another gross violation of lawyers’ rights,” Polozov wrote. Emil Kurbedinov a été arrêté alors qu’il se rendait de son domicile à son bureau et a été transféré au ministère de l’Intérieur de la Crimée et de Sébastopol. Il est accusé d’avoir enfreint l’article 20.3 du Code administratif de la Fédération de Russie – diffusion publique sur sa page Facebook d’un symbole appartenant à une organisation «extrémiste». Il encourt jusqu’à 15 jours de prison et une amende pouvant aller jusqu’à 2 000 roubles. Il est actuellement en attente de son procès devant le tribunal de district de Kievskyi de Simferopol. Russian-controlled enforcement officers burst into the offices of human rights lawyers in occupied Crimea on November 6, and handed prominent Crimean Tatar lawyer Emil Kurbedinov a ‘warning of the inadmissibility of extremism’. The surreal document was identical to that handed to two of Kurbedinov’s colleagues and a civic activist on October 27 when the officers disrupted a meeting of the Crimean Solidarity initiative. The warning could, supposedly, not be issued at that meeting since Kurbedinov was away on a work-related trip, though it is possible that this was simply a pretext for staging a second visitation.